Johnny Jablon began preparing for his bar mitzvah in Poland in the summer of 1939. A month later, the Germans invaded. 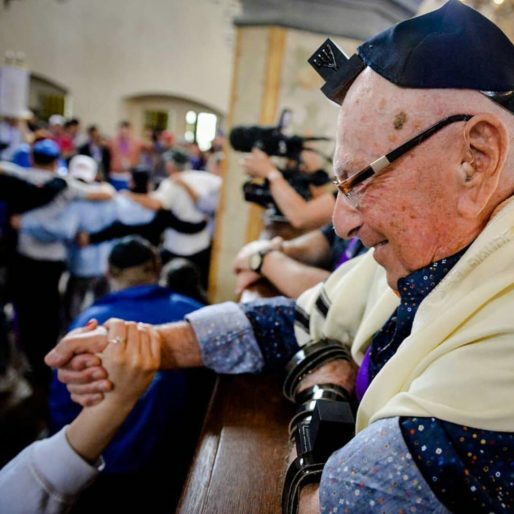 Now 92 years of age, Jablon returned to Poland for the first time since World War II to finally celebrate his bar mitzvah. Despite the abuse, the Jablons considered themselves Jewish Poles, with an emphasis on being full Polish citizens. In the summer of 1939, Jablon was learning to swim in Kraków’s new public pool and enjoying time with his aunt and cousins in a summer camp in Rytro, a resort town nestled in Poland’s Tatra mountains. His parents hired a rabbi to help him with his bar mitzvah studies. When the war broke out in September, his studies stopped—and the course of Jablon’s life was forever altered. “In one day, I lost everything,” he says. Moving to Montreal, Jablon married, opened an electronics store and began a new life. He never planned to return to Poland. “How could I go back?” he says. “I had no one left. I didn’t want to go to see the ashes of my family.” Last May, when his wife, Sally, passed away, Jablon began to reflect on his life in Poland before the war. At the urging of friends, he decided that it was time to finally return on a “March of the Living International” trip to the country of his birth. That’s when Jablon met Chabad-#Lubavitch Rabbi Pinny Gniwisch. The director of #Chabad-affiliated “Living Legacy” in Montreal, Gniwisch has been leading “#MarchoftheLiving” trips to Poland for the past 13 years. This year, he served as the Montreal delegation’s official rabbi.